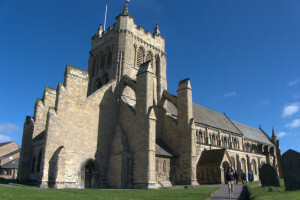 St Hilda’s Church is the parish church of the Headland, the old town of Hartlepool. It is a fine and impressive building close to the harbour entrance, and was built 1190-1250 of Early English design. Its vast buttresses were built to prevent it falling into the sea. It is a living parish church with worship for all age groups, and a venue for a broad range of concerts often followed by supper. Local schools are welcome to visit the church for teaching about the building and the Christian faith. In 2013 new heating was installed throughout the building, and chairs replaced pews in the nave. The church is home to a 7th century pillow stone which once marked the grave of a Saxon nun. The church is open to visitors throughout the year, mainly at weekends, and welcomes groups of pilgrims of all traditions and churches. Our main Sunday service (usually Holy Communion) is at 10.30am. All are welcome. For details of services and other information about St Hilda, you can visit the church’s web site.